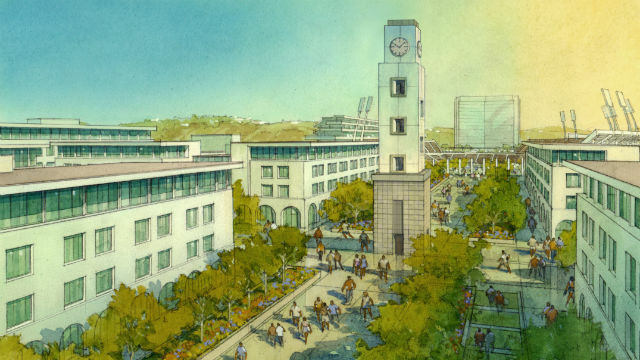 A rendering of the SDSU West campus green looking west toward the campanile and stadium. The developers of SoccerCity filed suit Wednesday in an effort to remove the rival SDSU West initiative from the November ballot. The suit filed in San Diego Superior Court claims Friends of SDSU, the group backing the university’s plan, misused the San Diego State University name and tricked voters into signing the ballot petition. Both plans are on the ballot, and whichever gets the most votes will earn the right to develop the former Qualcomm Stadium site in Mission Valley. SoccerCity is a private initiative backed by FS Investors, while SDSU West is a public-private plan backed by the Friends of SDSU coalition that consists of SDSU alumni, community and business leaders. Both plans would provide for a stadium to be used by SDSU, a pro soccer team and ultimately a pro football team. Friends of SDSU released a statement in response to the suit. “This lawsuit is a desperate attempt by FS Investors to eliminate voter choice about the use of the stadium property and distract them from the details of their flawed SoccerCity initiative. FS Investors are concerned because they know most voters support the SDSU West initiative, so they are trying to deny voters that choice. It is entirely appropriate for our initiative and campaign committee to utilize the SDSU name, given its purpose is to help San Diego State University grow its academic, research and economic benefits for San Diego,” the statment read. “It should also be noted that SoccerCity has used SDSU’s name in their pitch to voters repeatedly over the past year. If approved, SoccerCity would block San Diego State University’s growth potential; yet FS Investors has repeatedly used SDSU’s name and likeness to promote their campaign,” the statement continued. The suit was filed on the same day that the Friends of SDSU held a news conference to showcase support for their plan.